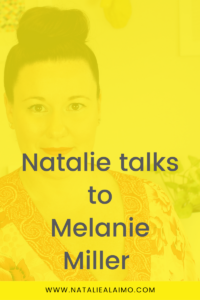 Every time I read this quote from Melanie Miller I get teary. I can’t help it. As I try to explain why I get choked up, my chest tightens. I feel like I live in the constant hustle of trying to achieve more. To do things differently. When will it ever be enough. When will I ever be enough. I realise that I wasn’t cut out for a ‘normal’ or ‘average’ life but when things don’t go as planed I end up in self doubt. Maybe I shouldn’t be dreaming big. Maybe I should accept the status quo. Often feeling like I’m alone in these feelings. And I guess when I Melanie said this, I had my permission. My permission to reject the status quo. My permission to reject ‘normal’ or ‘average’. My permission to live life on my terms regardless of what everyone else thinks, says or does. This is my life and I’m writing my own permission slip. I live with my furry best friend and office assistant, Ziggy. My “family” is my sister and my amazing group of friends. I won the friend lottery so I am proud to be included in their families. My proudest role is “Aunty” to my friend’s kids. To be awarded that honorary title, and be such a big part of their lives makes my heart happy. The Profit Lovers is a place for women to soak up knowledge and see how to implement it in their business. It is all about creating a business that is profitable, liveable and loveable. I encourage my Profit Lovers to embrace the “unsexy” side of business like numbers and sales funnels so they can create a sustainable income longterm. My main product is Profit Lovers Members Club, which brings knowledge, action, and accountability together to help women create amazing businesses. I also have a course the details the steps to create an online course. It is basically everything I have learned over the past four years wrapped up in a nice package! I do offer some one on one coaching, it isn’t the most profitable thing for me to do but I absolutely love it! I love seeing the results clients create over three months. I grab a smoothie and head to the office around 7 am. I like to spend the first couple of hours on my own stuff before touching email or posting on Social Media. I coach and consultant 3 days a fortnight so I start client strategy and coaching calls around 10 am and am usually done by 1 pm. 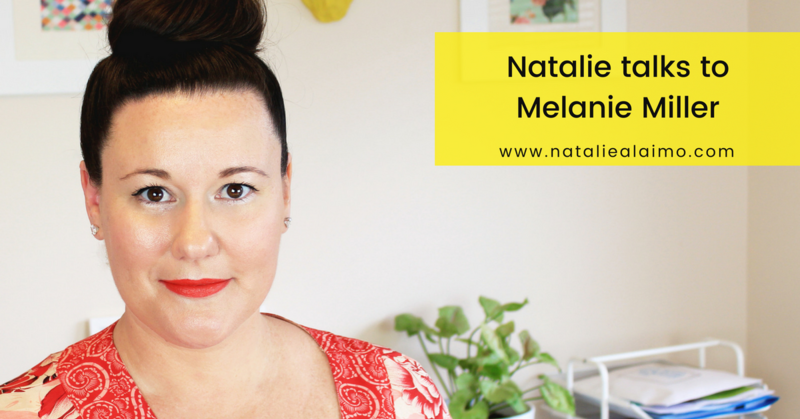 On the other days, I am creating Members Club content, working on my sales funnels, writing blogs on creating online courses etc. I am a huge beach bunny so I am constantly sneaking down to the water when it’s hot for a swim. It is a 3-minute walk so easy to fit in at least two swims! I tend to feel a drop in focus in the afternoon so I leave the office and do my own stuff. If I feel inspired I will head back into my office around 5 pm for another couple of hours work. I am a huge believer in doing as little as possible for the biggest return so I focus on being productive when I am at my desk and completely disconnecting when I am not. What is your current annual business revenue? Are you happy with this revenue level? Happy? Yes. But I have a deep sense that this is just the begining. There is so much more growth ahead. Has your revenue increased or decreased over the life of your business? It took a massive hit when my mum died. I had been caring for her for 18 months through terminal breast cancer. I think I was running on autopilot a lot. When she passed away everything came to a screeching halt. I didn’t ever want to be in that position again, which is why the Profit Lovers is now a growing online business! I have stopped trading time for money and moved 80% of my business to leveraged income. I feel so much safer now. When you hear that only 2% of businesses that are owned by women have revenue of over $1 million, how does that make you feel? Urgh… I feel disappointed. I also feel like we can change that and I know I have personally helped over 10 women hit the $1M mark through one on one coaching. Women who never thought it would be possible are now exceeding that goal. I remember the look of one of my client’s faces when we ran her annual sales report together and she saw that number. It still is one of my favorite business moments ever! I want The Profit Lovers Members Club to continue to grow. I was having trouble staying on track with my own goals a few weeks ago so I logged in and re-did The Productivity Kit. I know it sounds weird consuming my own content, but I had this list of resources and checklists that I could use instantly to get back on track. It took me 35 minutes to re-focus and my tracking sheet that shows my progress is literally in front of me right now. There is so much good stuff in there. Stuff that creates real and significant change, and I want to see it used by as many women as possible – so we can all hit the $1M together! What assistance do you need to achieve your goals or what do you think is holding you back? My goal for next year is to outsource more of my business. Right now I have help with a few tasks but I am doing way too many things that someone else could easily handle. I need to place more trust in others and remember that just because it isn’t done exactly the way I would do it doesn’t mean it isn’t right. Marie Forleo, Amy Porterfield, Denise Duffield Thomas are the first few that come to mind. I have to say I have some amazing Profit Lovers. Women who are nervous about facing their numbers or being visible by marketing their businesses, they push through for the financial safety and freedom for themselves and their families. They’re awesome! They inspire me constantly. Why did you go into business for yourself? Would you do it again? I was in General Management and I made lots of people lots of money. It was frustrating to always be working on someone else’s dream. Now I am working on mine and yes, I would do it all over again in a heartbeat. On days when you want to quit, what keeps you going? Fear. I am so fearful of having an average life. 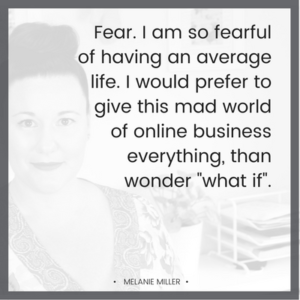 I would prefer to give this mad world of online business everything than wonder “what if”. Dreaming big just wasn’t part of my upbringing. We never had money and there was so much negativity around success (especially financial). I refuse to repeat that. I want to be a wild, crazy dream chaser. Any tips or advice for juggling life, family, friends, health and your business? Yes. Don’t get married and don’t have kids. Kidding!!! The biggest bit of advice I can give is to deal with your guilt. Women hold so much guilt around not being enough in every area of their lives. If they’re working on their business they feel guilty that their family is suffering and vice versa. I see this with my Profit Lovers all the time. Don’t be afraid to create boundaries that support you succeeding. There is that great quote, I am not sure who said it but it is so relevant for women. “You’re not required to set yourself on fire to keep others warm”. Is your partner supportive of your business and has that changed over time? Well Ziggy the Poochon is pretty demanding but he also likes to live the good life (treats, trips to the beach, puppy pampering) so he lets me do my thing 😉 *Jokes* I am single so I don’t have to answer to anyone which is great, but I also don’t have the financial support if things go wrong. How have you invested in yourself or your business? I have been terrible at investing in myself and my business. It is another thing that really needs to change. I would love to join a high-level mastermind in the next year to push me to a new level. “I am the hero of this story, I don’t need to be saved” – not actually a quote but song lyrics. It really resonates with me. It reminds me that I have everything I need to be everything I want to be. I grew up in an incredibly disfunctional family where our self-confidence and self-worth was chipped away at almost daily. I know my mum dreamed about something big happening like winning the lotto to save her. I wish she could have seen that she could have saved herself. So I keep those song lyrics close by as a constant reminder of my own power to choose and create my reality. As cliche as it sounds I freaking love Tony Robbins. The man is ballsy, brassy, shouty and over the top and I love it. Brene Brown is another firm favorite.